One of the most interesting old church edifices in the general vicinity of Wayne is the Gulph Christian Church, located at the intersection of Matson Ford and Old Gulph roads, in Gulph Mills. Standing slightly back from roads that are now traversed by a constant stream of noisy automobile traffic the church, in its quiet dignity, is reminiscent of a far different period. Its history begins 127 years ago when, in 1830, a minister of the Christian denomination from Philadelphia, Elder Frederick Plummer, began preaching at Gulph Mills. For the following facts concerning the subsequent history of this old church, the writer is indebted to Mrs. A. Irvin Supplee, who prepared a history of it on the commemoration of the 120th anniversary, in July, 1953. This history is filed with the Montgomery County Historical Society records, located in the Society’s building in Norristown. Mrs. Supplee, the former Miss Regina Stiteler, of Gulph Mills, now makes her home in Conshohocken. According to Mrs. Supplee, there was at first no church in which to hold services. There was a small, one-story school building, where Elder Plummer started to preach on Sundays. For these services he was driven, by horse and buggy, from his home in Philadelphia by George Righter, a resident of Gulph Mills. However, it was not long before the small schoolhouse was so overcrowded by an eager congregation that the services had to be held under the shelter of a large oak tree in the school yard. During the next two or three years the visits of the Philadelphia minister to his schoolhouse congregation were not regular, but old records show that on June 16, a number of persons were baptized in the Schuylkill River. Among them were Isaac DeHaven, Andrew Supplee, John Henderson Supplee, George Supplee, Jacob Rodenbaugh (who later became pastor of the church), John Sutton (who became a travelling preacher), William S. Wagner, Elizabeth Matson, Sr., Jane Zell, Eliza Supplee, Mary Ann Supplee, Susanna Smith and Jane Matson. On June 23, William Noblitt was baptized in the river. It was on the afternoon of that day that the church was organized, with 24 members, at a meeting held in the schoolyard, and on November 15 officers were appointed at a special meeting, held at the home of Andrew Supplee. These officers included William S. Wagner, secretary, and George Righter, treasurer. Deacons were Jacob Rodenbaugh, Andrew Supplee and Isaac DeHaven, while deaconesses were Elizabeth Supplee, Susan J. Wagner and Mary Ann Supplee. In making her search through the old church archives, Mrs. Irvin Supplee finds records of other baptisms in the Schuylkill River in August, September, October, November and even on December 25, of 1833. And those “who had the faith and courage to be baptized out of doors on Christmas Day,” Mrs. Supplee feels, deserve to have their names mentioned, even this many years later: Edward Parker, Jesse Dickey, Mary Parker, Elmira Righter (Broades), Ann Horn, Elizabeth Matson, Jr., and Ann Jones. In all, some 63 persons were baptized during Elder Plummer’s pastorate, which is indeed a notable record, considering the severity of the temperatures on some occasions. According to these same old records, there were also many special meetings, some lasting from two to four days. With a quaint old picture of Villanova College as it looked some 60 years ago as its heading, last week’s column told something of the beginnings of one of the best known institutions of learning in the Philadelphia suburban area. Information for the column had come from “Rural Pennsylvania,” a book written by the Rev. S.F. Hotchkin in 1897. It is a far cry from the college of 60 years ago to the campus of today. Year by year, handsome buildings have been added to those first few, the latest one being Villanova’s million dollar Garey Hall, the University’s new law school building (with two other buildings under construction). Earl Warren, Chief Justice of the United States, laid the cornerstone of this newest addition on Saturday, April 27. Assisting Justice Warren was the Very Rev. Henry A. Greenlea, O.S.A., chairman of the University Board of Trustees and provincial of the Augustinian Order. One of the most imposing of the more recent buildings is the new University library, which opened in 1949. According to the bulletin it contains a collection of approximately 115,000 volumes in addition to pamphlets, government publications and bound volumes of periodicals. The library stacks, with an eventual capacity of 400,000 volumes, are open to all students. The main reference room provides the current issues of more than 500 publications. “Special use” rooms in the library include a music and television room and a browsing room for recreational reading. The Villanova Room itself houses an extensive collection of historical material relative to the early history of the college. Among the many other buildings is Mendel Hall, erected in 1929, which houses executive offices, classrooms and laboratories for liberal arts, sciences and engineering. The Commerce and Finance Building, completed in 1931, has executive offices as well as classrooms for students in the above subjects. The University Chapel, which serves also as the Church of the St. Thomas of Villanova parish, is one of the older buildings, having been erected in 1888. It is the center of the religious activities of the university. St. Thomas of Villanova Monastery, erected in 1902, was rebuilt in 1933 and now houses the clerical faculty. Commodore John Barry Hall, erected in 1948, provides classrooms, laboratories, offices, and rifle range for the Naval Reserve Officers Training Corps, and the chemical engineering laboratories, classrooms and offices. St. Mary’s Hall, built in 1912, is for the use of the Seminary department of the University. Austin Hall, Fedigan Hall and St. Rita’s Hall are all modern dormitory buildings, housing a total of about 220 students. The Field House, adjoining the stadium and athletic field, is a large, fireproof structure, built in 1932. Providing ample opportunity for indoor sports, it seats some 1,800 spectators in the balcony. A separate wing of the building houses a modern swimming pool. The main floor of the gymnasium seats more than 1,500 spectators, and there is a large stage suitable for plays and other student entertainments. Galberry Hall, a former residence fronting on Lancaster avenue, is occupied by the Department of Research and Development. A new dormitory, Sullivan Hall, opened for the final term of 1954 for the accommmodation of 400 students. Dougherty Hall, a Student Union building, with housing and dining facilities, barber shop, student offices and lounges, was completed in 1955. The introduction to the recent university bulletin states that during the first 50 years of the college’s history, a total of 1,599 students were taught there. During the past 20 years, the enrollment in any one year has exceeded this 50 year total. The student body is drawn from all states and from foreign countries, especially the Latin American republics. At first glance the reader may not immediately recognize the picture, shown above, as one of our nearby Villanova University. 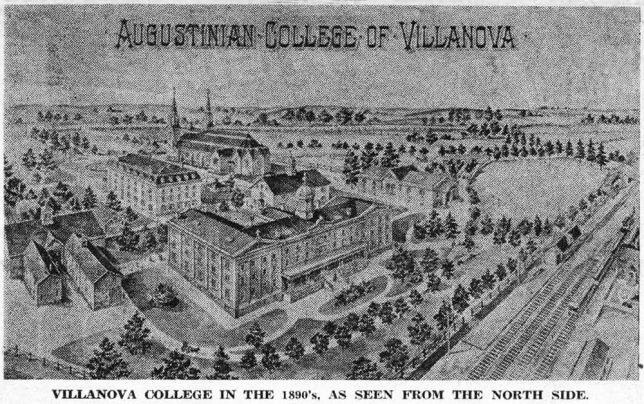 But time makes many changes, and it is at least 60 years since this picture was taken, when Villanova was only a college. It appears in “Rural Pennsylvania in the Vicinity of Philadelphia,” written by the Rev. S.F. Hotchkin and published by George W. Jacobs and Company, Philadelphia, in 1897. “Slightly less than a mile west of Rosemont, with its buildings crowning a gently sloping hill, stands Villanova, the mother house in the United States of the Roman Catholic Order of religious known as Augustinians. Their first establishment in this country was made at Philadelphia towards the close of the last century when, in 1776, the Rev. Dr. Matthew Carr, a member of the Irish Province of their Order, founded the Church and Convent of St. Augustine. “Villanova, an offshoot of this Philadelphia venture, was planted in 1842, chiefly through the agency of the Rev. John P. O’Dwyer, on the estate of the late John Rudolph, a well known Catholic merchant of Burlington, N.J., and Philadelphia, who there, at his country seat, known as ‘Belle-Air,’ set up a station, or meeting-place for the Catholics of the neighborhood when occasionally they gathered for Mass and the service of religion. This was about 1806. “Shortly after Mr. Rudolph’s death in 1838, a large part of his property was purchased by the Augustinians, who purposed to establish there, the headquarters of their Order, in the country, a complete religious and education center, with convent, novice and study-house for their own members, and college for the instruction of the laity in classics, scientific and polite learning. Under the protection of one of the famous saints of their Order, Thomas of Villanova, Father O’Dwyer opened the convent and college at ‘Belle-Air,’ henceforth to be known as Villanova, in 1824. “Their choice of titular saint for their institution seems appropriate, as the name Thomas recalls the holy superior of their Province of Castile in the 16th century, under whom first Augustinian missionaries to the new world founded in the City of Mexico, in 1551, the first school of learning on a large scale in America. “At Villanova, besides the charge of the brotherhood and college, the Augustinians had care also of the Catholics as far around as ten and 15 miles. In 1843, Fr. O’Dwyer, the leading spirit of the new venture, numbered in all about a half-dozen families in his congregation. In 1844, Bishop Kenrick dedicated Villanova Chapel, and in this building divine services were held until 1872, when a frame structure, now used as college gymnasium, was erected to meet the growing needs of the faithful. A few years later in 1883, was begun the Gothic church which, with sitting room for 700 persons, seven altars, and its noble apsidal choir, gives ample scope for the accommodation of the laity, and the observance of ritual in all its fullness. Offshoots of the Villanova mission, but now independent churches, are the congregations at Berwyn, Bryn Mawr and Wayne. “The year after the opening of the monastery in 1843, by sanction of Gregory XVI, Villanova was created a novice-house of the Order. And in this same year, the habit of religion was first given to two aspirants of the Order, one of these, Brother John, a veteran of some 85 years of age, dying in 1894. In 1843, the the college course was opened to the laity – 13 youths being enrolled on the first day – for their education in sacred and profane studies, philosophy, the classics, humanities, music, drawing and the modern languages.